I have just realised, while I’m keeping up with this photo project, I am falling behind with my reading. A whooping seven weeks into the year and I’ve just finished my third English book, never mind none in French yet. And rather frantically, I haven’t been able to find my public library card either. A spring cleaning is seriously needed because I’m hoping to make this year the one where I make full use of the libraries around Paris instead of buying more books when I have no space to store them. 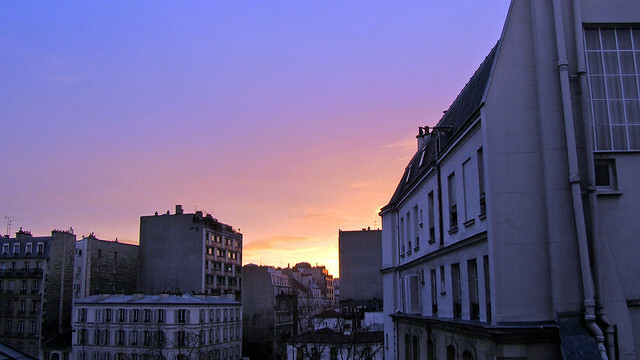 11 Feb: Frédéric often tells me how much he loves the winter sky, specifically the softer colour hue at the end of a fine day. This evening was one of those where you couldn’t take your eyes off the horizon, where shades of colours blended into one harmonious palate. I wasn’t the only one who stood rooted at a spot looking up – a number of people on my Twitter were excitingly sharing their photos of this beautiful evening. 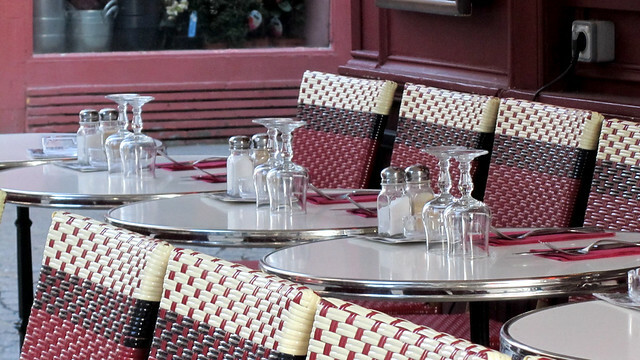 12 Feb: On a cold cold wintry day, are there really many who would choose to sit out on the terrace of a café for a drink or a meal? I know I am not that courageous myself, but I could also suppose visitors would find it difficult to forego what is seen as quintessential charm of Paris. A spot to watch the world goes by. A table to place a notebook so no inspiration would leave unjotted. A cup of coffee to warm the frozen fingers. And a second chair whereupon one’s lover would sit and lean over to plant a kiss. 13 Feb: I should probably stop talking about the flooding Seine but I feel I should at least share this one final image of the condition before that. 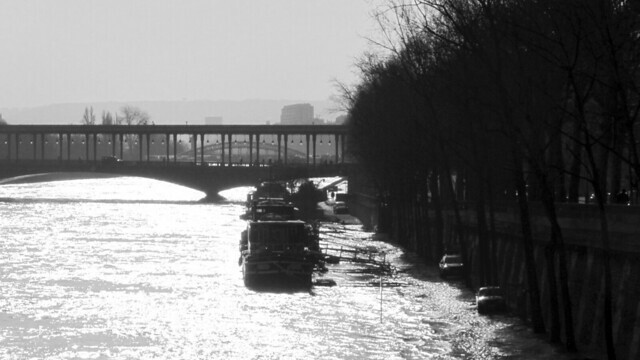 I shot this in front of the Eiffel Tower, where water was lapping onto what was normally pedestrianised walkway. There were cars parked too, but I’m not sure if they were newly parked, or if they belonged to owners of the boats, or if they were stranded because of the rising water level. 14 Feb: There are newsagent kiosks everywhere in the city, usually around main junctions and along avenues with heavy footfalls. 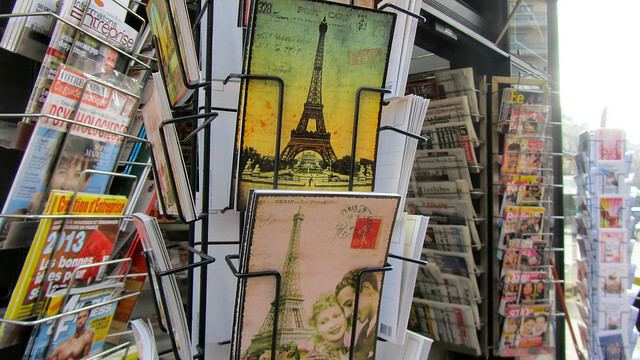 Apart from newspapers and magazines, most also stock a range of postcards and greetings cards, some souvenirs, and some light snacks/drinks. I don’t usually feel comfortable taking a picture of a kiosk, as the vendor is omnipresent and I’d prefer to be more discreet. Today, however, I didn’t see anyone around so quick whip of the camera out, click and go! 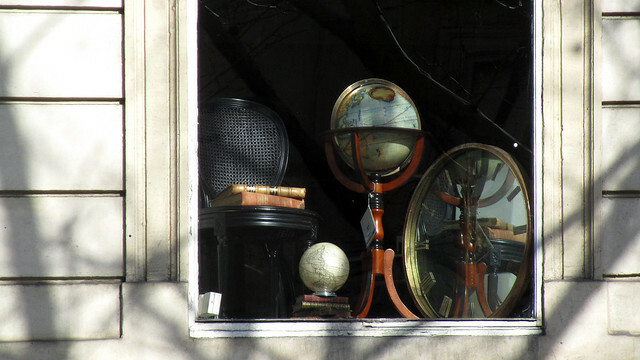 15 Feb: It is apt that I spotted a window today displaying these wonderful antique globes. I’m starting a short (3-classes) online course on Skillshare next week that will be taught by Anne Ditmeyer on the subject of making beautiful maps. How exciting this is! I am not the most creative person around, but I like to nurture what I consider my artistic side, however feeble my ability is. Besides, if I don’t even try it, how would I know what I am capable of or not? Let the challenge begins! 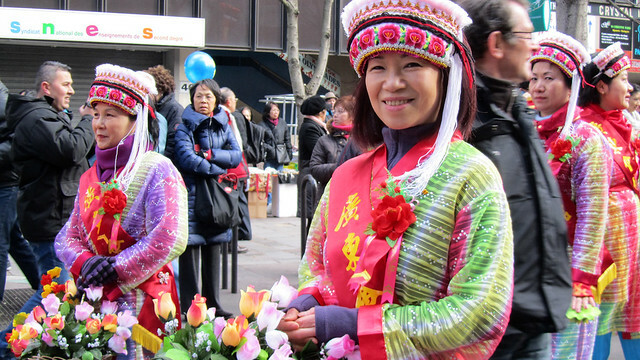 16 Feb: What a sunny Saturday it has been, just right for me to participate in a walking tour of the neighbourhood of Les Halles. Part of the walk took us through l’église Saint-Eustache, a grand church that has unique architectural style, with a mélange of late Gothic and Renaissance. 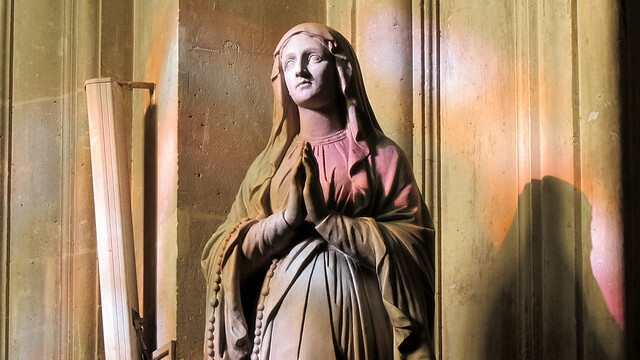 It was near the exit that I couldn’t help but be drawn to this statue of the Virgin, illuminated by the incoming light, filtered by the stained-glass windows. It was, well, arresting. hehehe, i know, but now nearly coming to an end. how quickly time flies! I’m sorry you’re behind on your reading, but these photos really do make up for it (from our point of view)! The black and white river shot in particular!